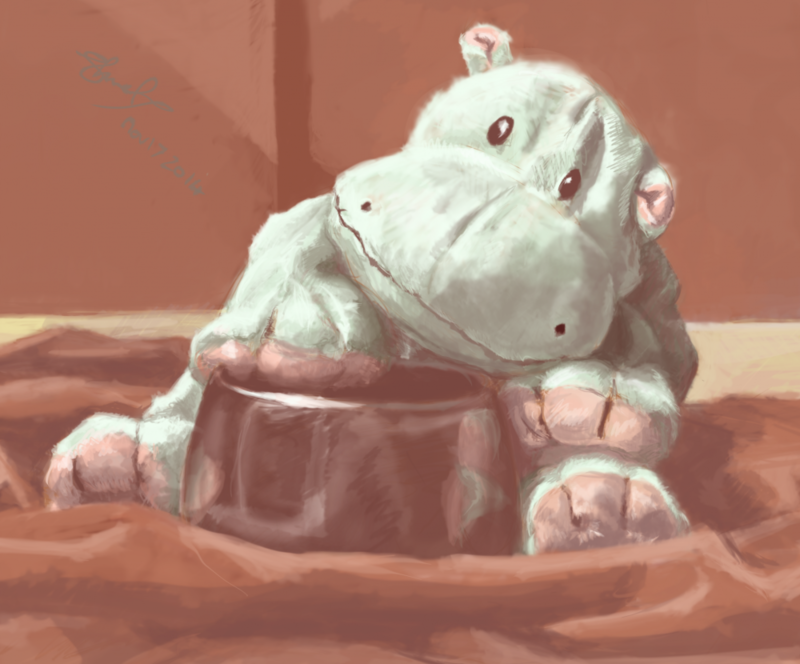 I realized I never posted my drawing of our noble friend the mippo to lj. buddhistmippo is an excellent model; stays still and his smile never looks forced. He's the first drawing from life I've done in over a decade, how did that happen? This picture makes me happy. Such softness and light. Also, discovering the mippo's lj makes me happy. Makes me happy too :) It's my "Shweta spent a lot of time in the Rijksmuseum staring at Dutch Master work as a kid" painting :) All about the light n texture. He hasn't posted for a while, I'm afraid. He's even worse at it than I am. That is terrific! I wish I could take a class in brush work from you. Thankyouu :) but... you know I don't actually know what I'm doing when I do it, right? beyond "high opacity small brush = sharp lines, low opacity big brush = fuzz". I just... sort of scribble till it looks right, and have intuitions on it based on years of doing this. I understand that approach . . . which gives me muddy watercolors, alas. oh yeah this approach only wrks with opaque media. Oils/acrylics or computerdrawing. Watercolors really need better planning, and mine turn to mud as often as not too. This drawing was closest to soft pastel work, except that with soft pastels if you attempt too many layers it flakes or tears the paper. Bingo! That's me. I wonder if there's a drawing program for mac that doesn't cost a fortune. GIMP is free & open source & there are Mac versions! It's like a photoshop clone but without some of the very fancy stuff. I like it. Ooh! Thanks! I'll give that a try. I just looked but as soon as it said I have to build source code, I resigned in defeat. I have no idea what that even means. Poo! That's where I went, but the language was so unclear! Is there some kind of stylus one has to get? Or some kind of flat board? Fumbling around with my wireless mouse while watching the terminal display is like drawing drunk. people *do* draw with the mouse, or with trackpads. I don't know how they manage it. I use a wacom intuos 3 tablet & pen - I actually have a spare tablet I could send you. (I'm afraid even just the pen is expensive, but pretty sure it's less than half the total price). I'm going to see if the spouse can find them cheap over at his university store, as they have art and graphics design departments. I don't want to create one more hassle for you, when you have to be already maxed out with a continental shift imminent! okie! Let me know if that doesn't work out? Apparently we do have a spare pen also, though we won't have access to either for a few months because shipping. Thank you. Yeah--and when one doesn't even begin to know the language . . . I realized I never posted my drawing of our noble friend the mippo to lj. Thank you :) he's an excellent model, didn't even scratch his nose! I'm sure he is happy to be going back to Berkeley! There are important people to sit on there after all. Totally awwww! Love the way you captured his expression. thankya dear :) I am pretty proud of that, since it's harder to get head-on than in 3/4 view.